Looking for an alternative to conventional medicine this cold and flu season? In this article Nicole Duelli shares wellness tips from homeopathic medicine. This homeopathic plant has had a long history. It was a godsend during the 1918 Spanish Flu epidemic, when medical physicians using homeopathy reported a 99% success at a time when death rates were soaring. Still one of the top homeopathic flu medicines today, Gelsemium works best when the leading flu symptom is exhaustion. Other indications for using it are your typical flu symptoms: chills, heavy limbs, headaches and body pains. Every medicine cabinet should have homeopathic Gelsemium — it’s safe for young children, pregnant women and our planet! You know the kind — that dry, hoarse, croupy cough that sounds almost like a seal’s bark. If you have heard that from someone in your family recently, Spongia will help it resolve within a day or two. While there are many homeopathic remedies for coughs, each for a very specific type, none rivals Spongia for that dry, croupy cough. If your child tends to develop croup in the middle of the night, hang on to Spongia for the next time. Not only will it help settle croup that night, but it also prevents recurrences. So you’ve got a clingy, whiny, snotty child who is feeling under the weather with a cold that just won’t go away? Pulsatilla to the rescue! Homeopathic medicines are holistic in the true sense of the word, so children who become Velcro kids emotionally when physically ill typically need Pulsatilla, whether they have a runny nose, earaches or a cough that lingers. Homeopathic medicines are easy to use with just a little practice. Choose one of the above in a 30c potency, which is widely available, giving 3-5 pills on the tongue three times daily for one or two days only. Kids love them! As symptoms improve, stop and repeat only if signs return. When improvement is not obvious after a day or two, switch to a more suited remedy. Look for one that closely resembles the symptoms your child experiences, since homeopathy is based on the like heals like principle. Homeopathy is a unique, natural system of medicine trusted by 100 million people in Europe. Slower to catch on in Canada, it’s a mom’s best-kept wellness secret. It’s no secret that prevention trumps treatment. In the winter season especially, ensure everyone gets their beauty sleep — our bodies heal and rejuvenate while resting and sleeping. Add ginger, garlic and cinnamon to your cooking during the cold months and swap white sugar, which thwarts the immune system, with honey. Finally, go for a walk, run, skate, bike or hike—even in winter. We are so lucky to live on the West Coast, and fresh air cleans our lungs, nourishes our cells and strengthens immunity, while at the same time reducing stress. Just a few healthy habits go a long way when integrated into the daily routine. Curious to learn more about homeopathic medicines and other tips for fevers, coughs, earaches and other winter ills? It’s easy! 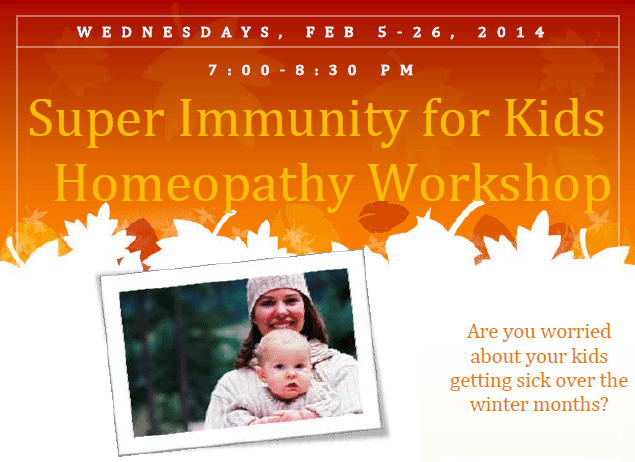 Just sign up for the Super Immunity for Kids Homeopathy Workshop, which runs for four Wednesdays this February and you’ll be prepared the next time someone in your family gets sick. Send an email to info@vancouverhomeopath.com or visit www.vancouverhomeopath.com/blog (look under classes) to find out more.